Honestly, when I first looked at the census report I had to go over the calculations at least five times. This was primarily just because of the sheer disbelief that a population that is almost 15 percent of the American population and has 7 percent of America’s businesses does not even generate half of 1 percent of the $30 trillion in sales that all American businesses generate. Given the abhorrent figures I see on African America institutions daily, even I was remiss at just how shocked I was. If this was a fight, then one would have to wonder just when our “trainer” would throw in the towel and stop the fight. Of the four recorded Diasporas shown, African Americans are not just in last place, they have been lapped at least once by every other group in terms of total sales divided by total firms. A strong sign of capital making its way into communities (or indirectly out of it). European American firms have over six times the ASPF, Asian Americans firms have almost five times the ASPF, and yes even Native Americans firms have over double the ASPF that African American firms have. This is probably a good place to insert a number of expletives at the dismay any economic strategist would feel about reviewing this kind of report. However, one must ponder exactly why are we here and how do we manage going forward with this information. First, one of the startling statistics within the graph aforementioned is number of firms with paid employees. Entrepreneurs and companies do not tend to hire until they have reached a threshold that the business is producing enough revenue to bring in additional workers. A company brings in workers if it believes that by doing so it will help the company grow by increasing either efficiency or productivity. If Company A hires a worker for $30 000 a year, then Company A believes that worker can generate at least $30 001 in efficiency or productivity to the revenue of the company’s bottom line. Remember, companies are in it for profit, not charity. A worker producing less in revenue than is being paid is on their way to ensure the company is probably heading out of business. Labor still constitutes the majority of a firm’s cost regardless of industry. Therefore, the percentage of companies with with paid employees is a healthy indicator of a community’s economic strength and growth prospects. On an indirectly related note, this also plays a large role in explaining African American unemployment rates maintaining double digits. No surprise that Asian Americans are above the national average and have the nation’s lowest unemployment rate. Prior to the recession, they also had a higher median net worth than European Americans. 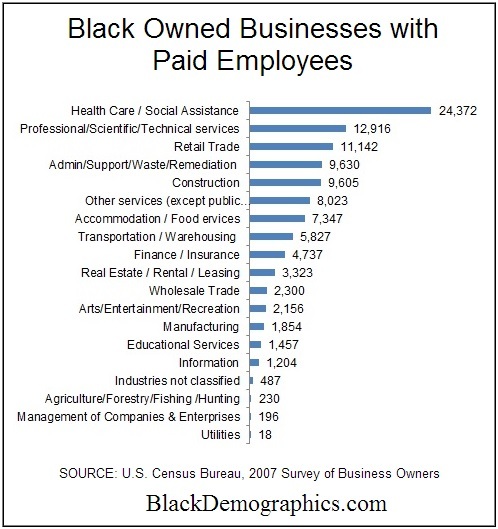 Secondly, it helps to examine the concentration of where our businesses are in terms of industry. The graph below shows that of our firms with paid employees that almost one-fourth are in the health care/social assistance sector. Given the boom that is occurring in healthcare, one would assume we would be fairing much better with such a large concentration in that area. However, within that that number we tend to be concentrated in the home health aides business. In comparison, medical and health services within the same sector produces 400 percent higher revenues. A sign that even among our businesses we tend to be at the lower end of the value chain or at the very end of it. Lack of access to funding and business training tends to be primary issues of why our businesses lack the ability to growth and tend to be in sectors that have minimum start up cost associated with them. This to some degree explains why there are no African American owned airlines, car companies, major integrated energy, and other capital intensive businesses. Business sectors that produce products which have immense sales volumes, we have essentially locked ourselves out of much to our own doing. African American financial institutions like credit unions and bank contain less than one percent of African America’s buying power. This severely limits the lending ability to African American business growth and thereby limits our ability to enter into more lucrative industries. Sales are more important than buying power to a community. The revenues generated from sales allow for hiring which drops unemployment and raises buying power, wealth creation which can be reinvested into schools and other community services, and ultimately help create self-sufficiency for our communities. Our business portfolio must ultimately diversify into deeper parts of the value chain in all industries, but ultimately in order to do so it must start with strengthening our financial industry to allow for capital to grease our entrepreneurial engine. This entry was posted in Business and tagged african american business, sales. Bookmark the permalink.